Lower overheads and start-up costs mean it’s easier for entrepreneurial types to introduce fresh ideas and the best food trucks are those who are afraid to bring new dishes to the streets. 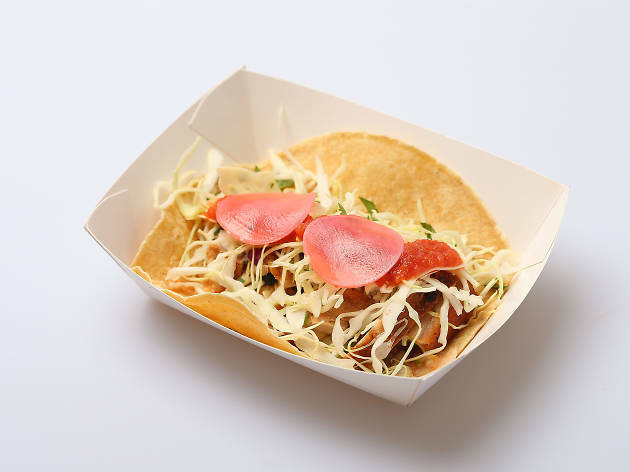 From travelling tacos to Greek street eats, take a ride with us as we uncover the best food trucks in town and learn how to track them down. Dining on a budget? 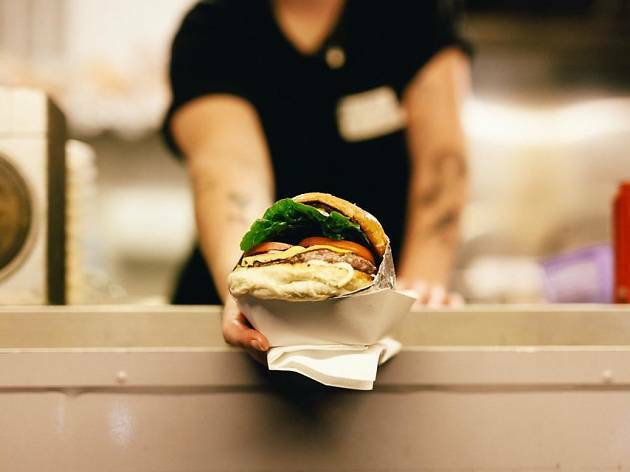 Check out the 35 places to get a cheap meal every night of the week and our favourite cheap eats under $20. 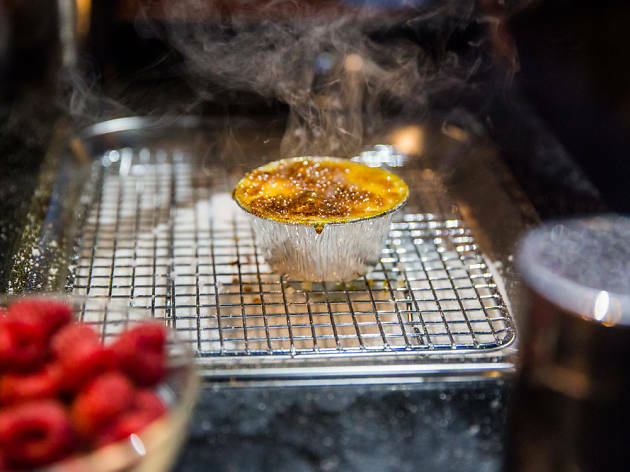 Ghost Kitchen's take on the Taiwanese breakfast street food dan bing is best described as a flaky roti topped with an egg that’s cooked on top while the bread is still hot on the griddle. 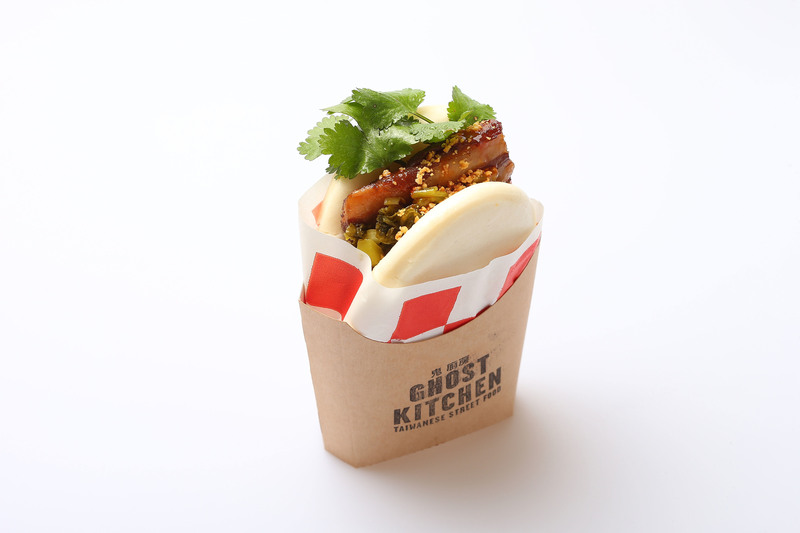 Opt for the ‘the lot’, where your eggy pancake is wrapped around a crisp fried Chinese doughnut and a generous sprinkling of sweet/savoury pork floss. 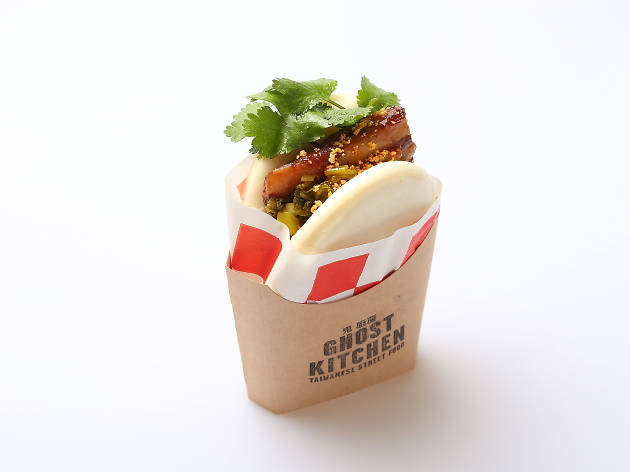 The braised pork belly gua bao is both rich and light at the same time; the steamed bun a suitably fluffy receptacle that soaks up the pork juices, balanced out with the sprinkling of fresh coriander and pickles. 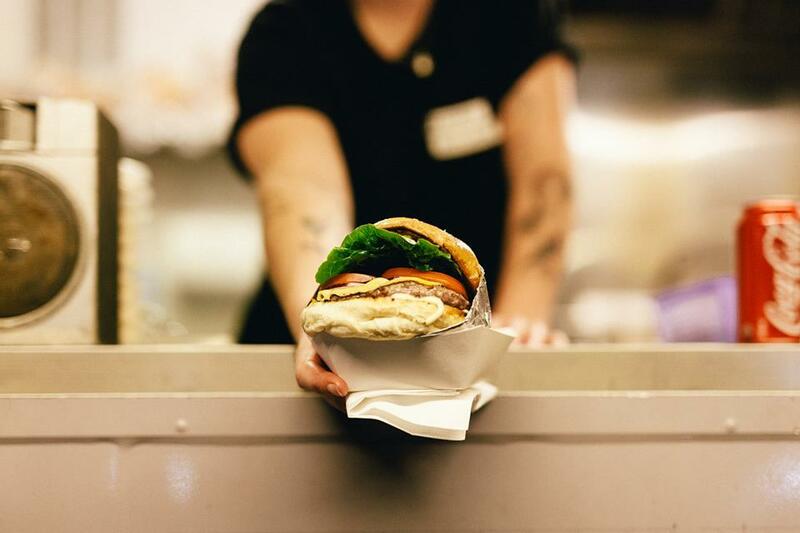 Probably the first burger truck to have chain stores, Mr Burger's buns are so popular it now has five permanent stores in Melbourne, as well as the roving food truck. 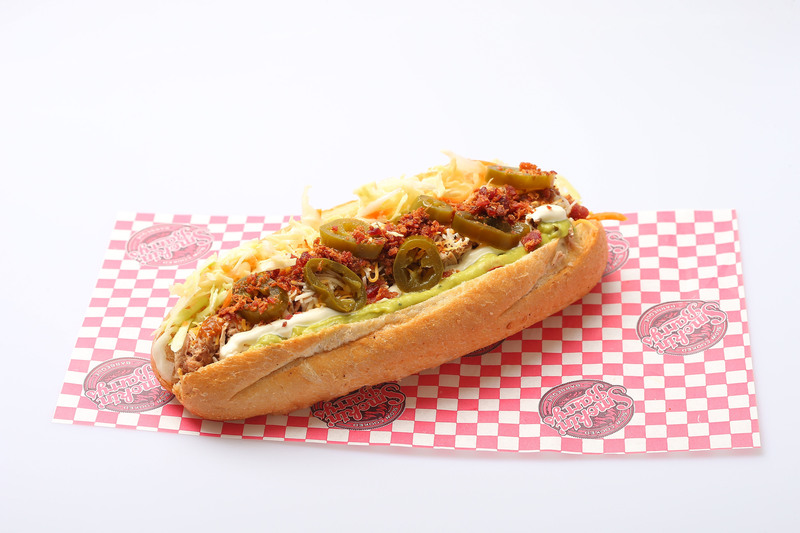 You can go simple with the eponymous hamburger (bacon optional but recommended), or go all out with the Mr Hot, a spicy jalapeno packed number. Try the loaded trucker chips topped with melted American cheese and bacon bits if you need a big fry-up. One of the pioneers of Melbourne's food truck scene is Raph Rashid, who is selling some of the better soft shell tortillas going. 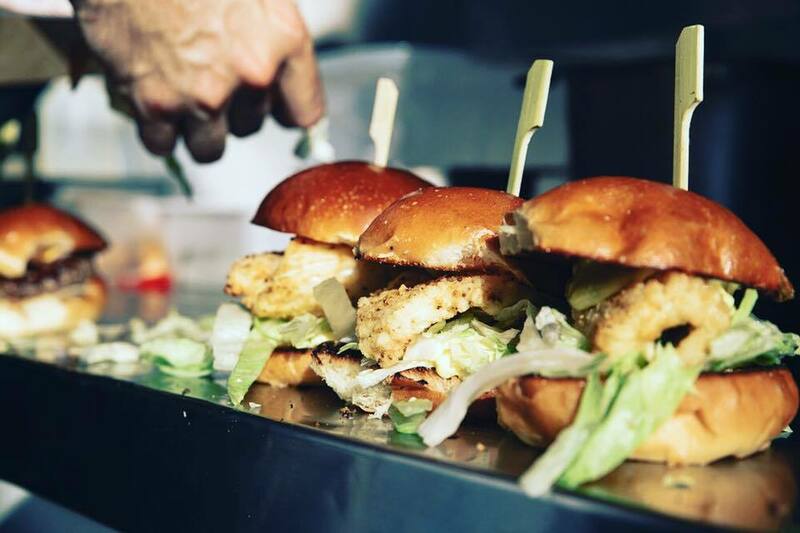 Their lightly battered and fried rockling fish fillets comes with a rough 'slaw, squeeze of lime and aioli. 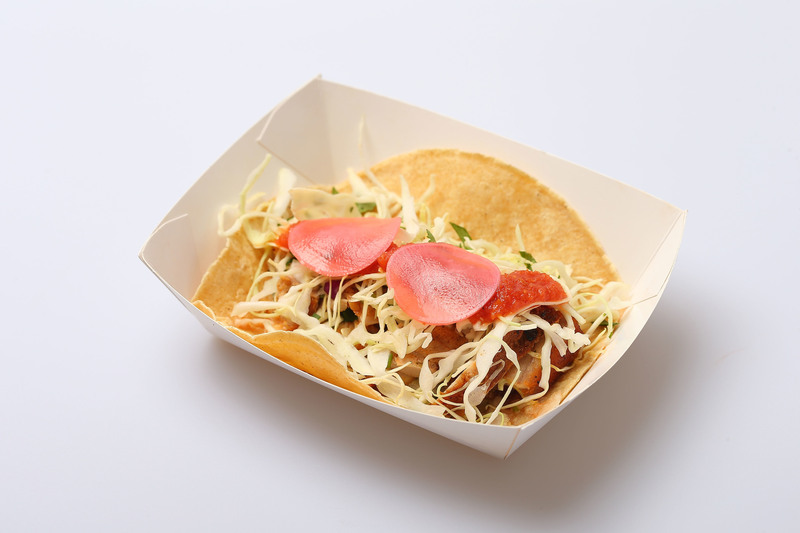 Or order the smoky strips of beef, polka dotted with radish slices and salsas galore – they're our pick. There's a mushroom option too. The tacos occasionally require some DIY flavour assistance, but there’s enough El Yucateco hot sauces in mild green and painful red if you yearn for the burn. Here's another one from Raph Rashid. 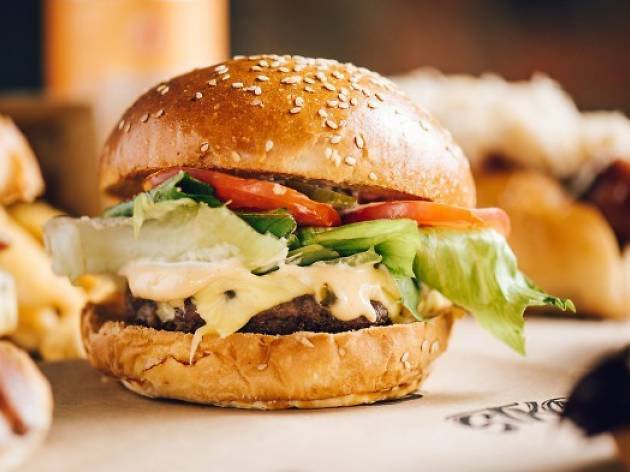 The signature Raph burger from Beatbox Kitchen never fails, the beef pattie served pink with a caramelised crust and topped with cos lettuce, tomato, onion, cheddar and Stereo sauce (a mixture of mayo, dill pickle, cayenne and lemon juice). It's no-fuss and we appreciate a good burger that won't leave sauce and juices trickling down to your elbows while you eat. 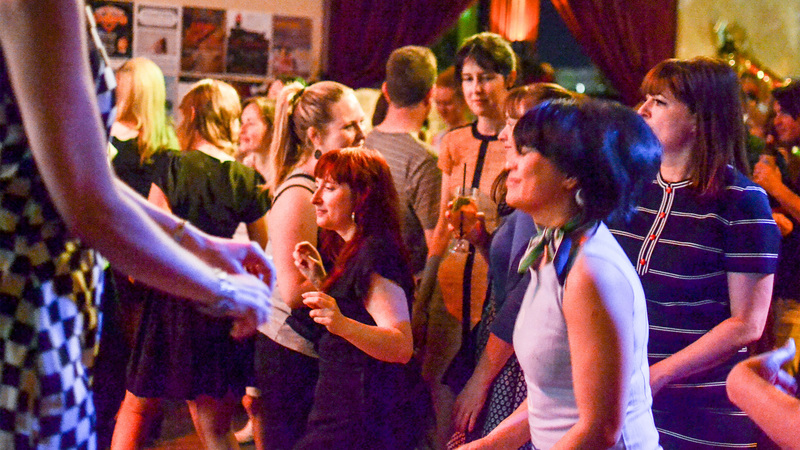 Find them at summer festivals or at the permanent Beatbox Kitchen shop in Brunswick. 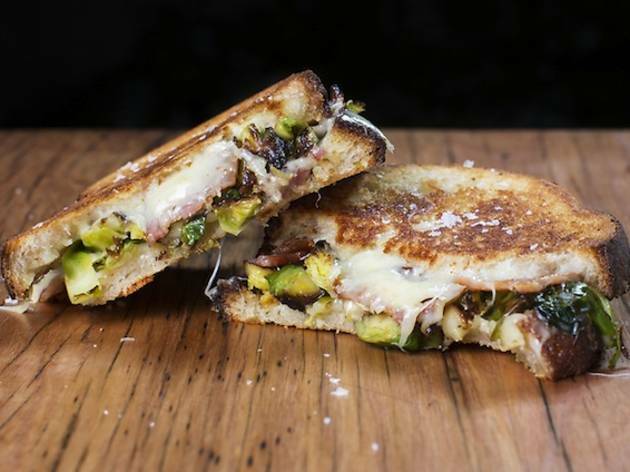 This ‘sandwich pressery’ on wheels serves up some pretty unusual toasties. Sure, you could keep it simple and grab a classic toasted cheese. 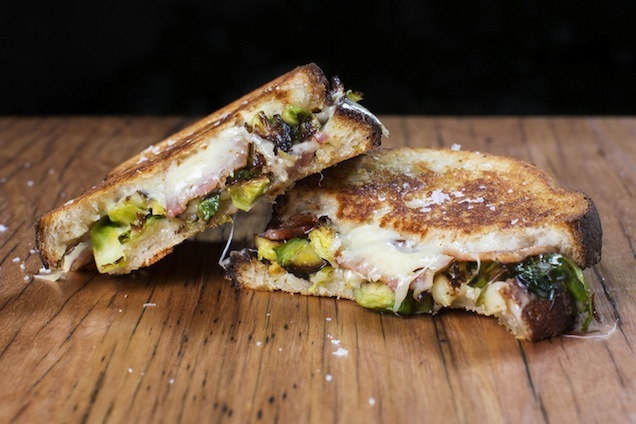 Or, you could try something a bit different, like the ‘Russell’ (gouda, bacon, shaved brussel sprouts, walnuts) or the ‘Fonz’ (fontina, mixed sautéed mushrooms, English spinach, roast garlic and thyme butter). 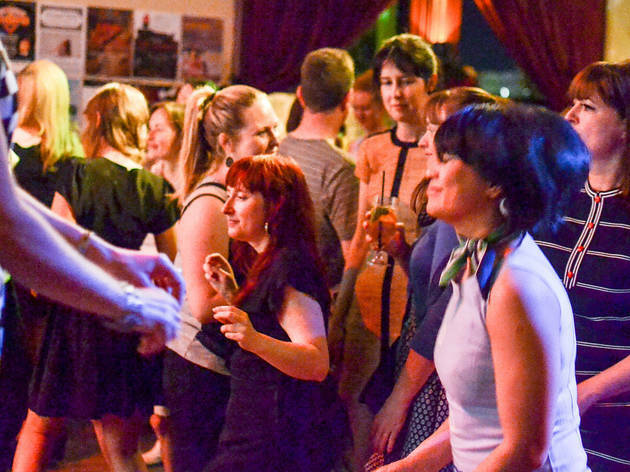 Find Toasta's permanent digs in Footscray. 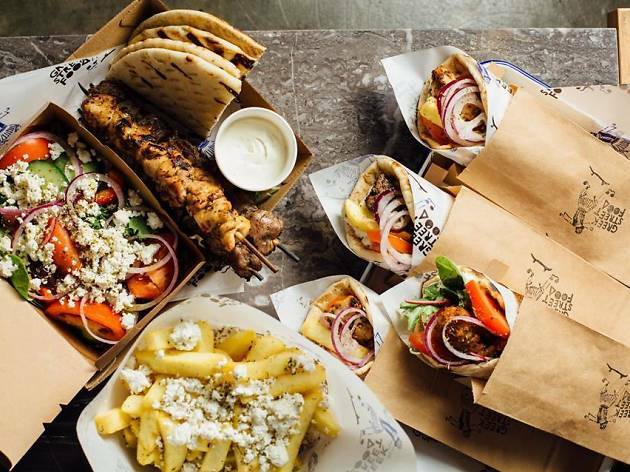 Greek souva shops are among Melbourne's most-loved cheap eats, so it's a no brainer that Greek Street Food is one of the city's longest running food trucks. 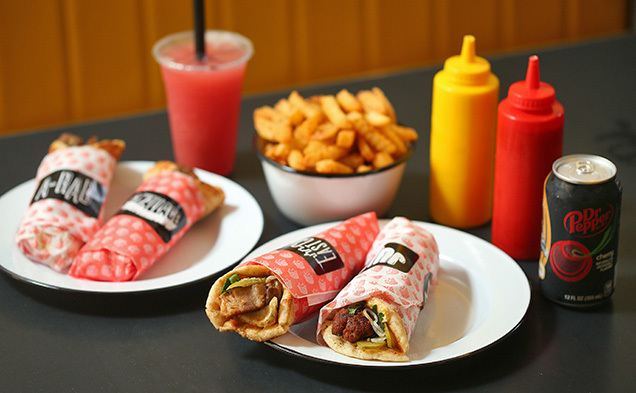 Their main offering is cheap souvlakis under $10, though you can also get grilled kalamaki sticks with a combo of salad, dip and chips. Twenty dollars will go a long way here, and that's how it should be. 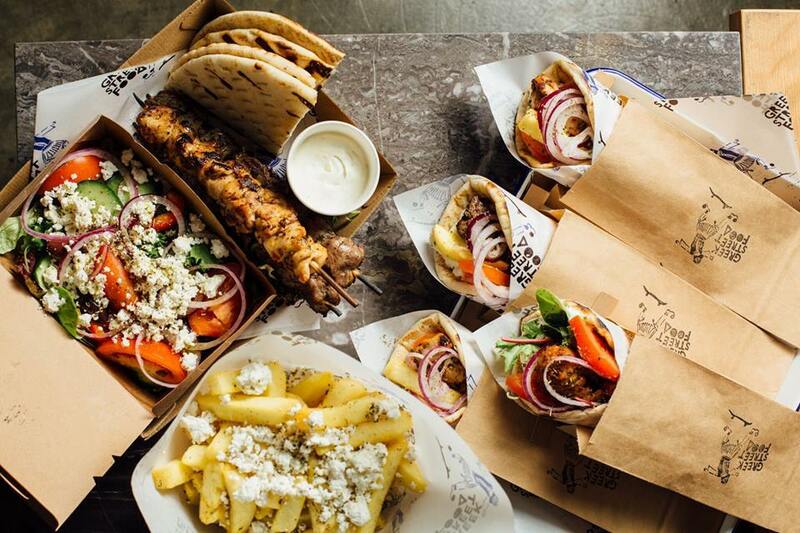 Greek Street Food has also opened a permanent spot on High Street in Thornbury so you don't have to chase them down if you're hankering for a souva. 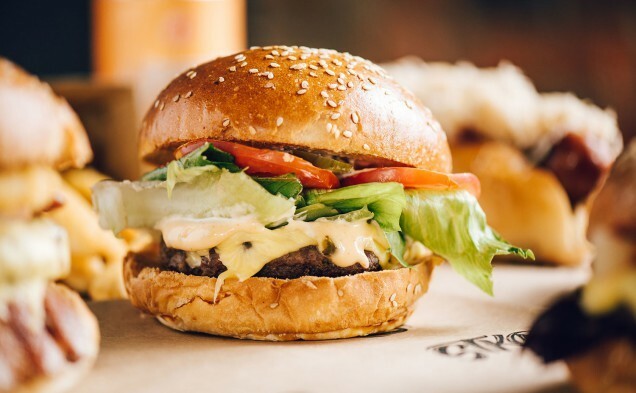 You might recognise St Kilda Burger Bar from its home next to the bayside pub, the Grosvenor Hotel. 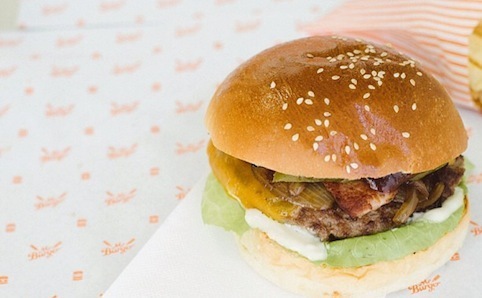 Grab a top-notch burger to go from their food truck. 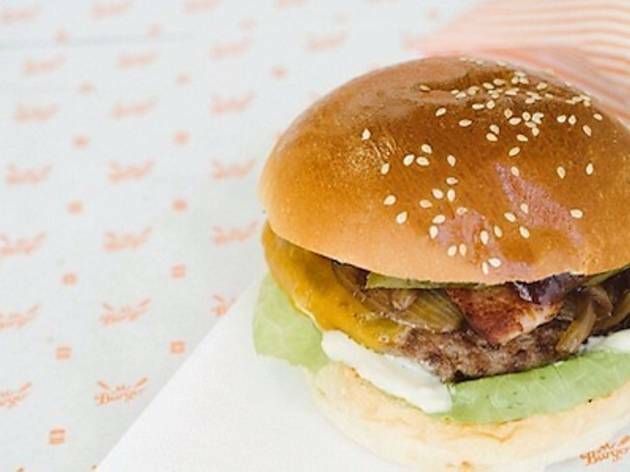 They're offering the signature Grosvenor burger with a juicy burger patty and streaky bacon. There's also a great vegie burger with roasted mushroom, Swiss cheese and pesto. 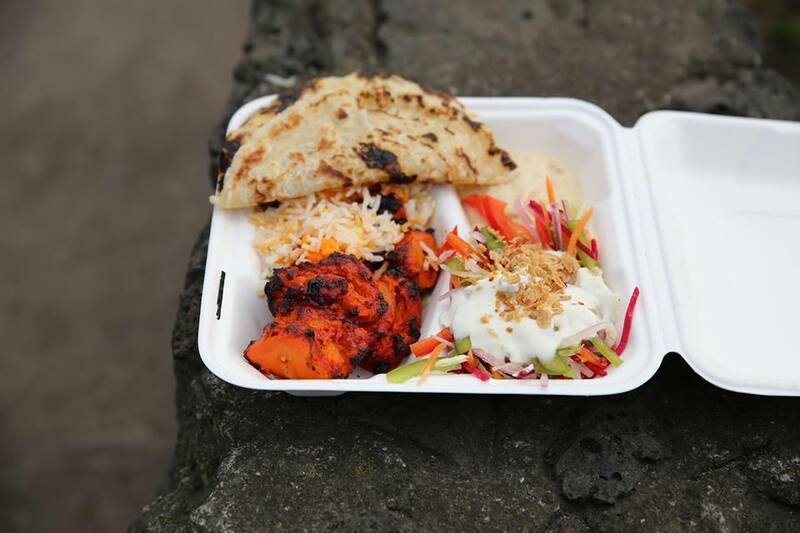 If you're after some excellent tandoori chicken on wheels, look out for Yo India. 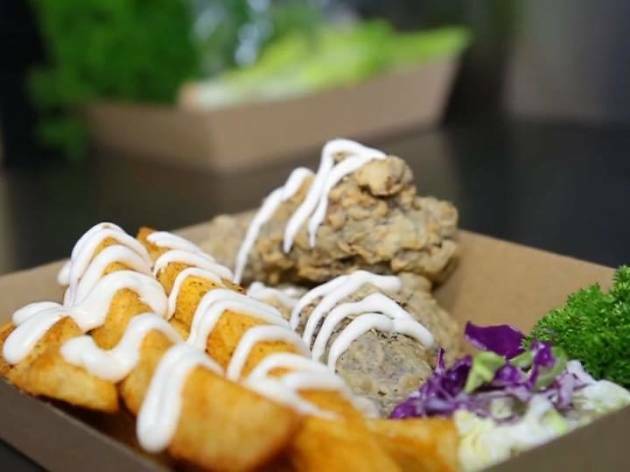 Previously called Big Cook Little Cook, the truck is popular at festivals and are always pumping when they show up at food truck musters like Welcome to Thornbury. 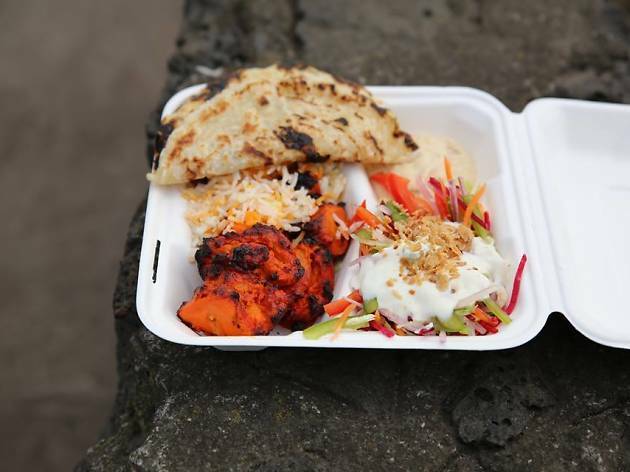 If you do find them, expect Indian classics like butter chicken, butter paneer, lamb korma and a smoky tandoori chicken tikka you can get with rice and salad or wrapped in roti. If you ask nicely, they'll pop some butter chicken sauce on that barbecued chicken for you. 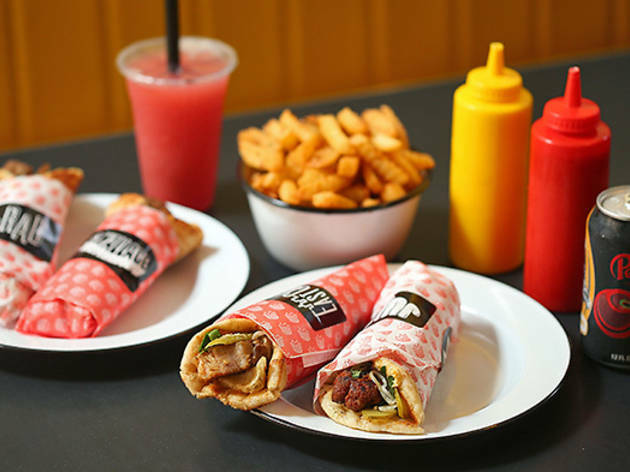 Shane Delia's Biggie Smalls shook up Smith Street's late night kebab game when it opened, and now the Maha head chef is taking Biggie to the streets. Sticking to his Middle Eastern roots, Delia nails the cheap kebab: try the classic beef, flaxseed falafel with smoked hummus, or the fried chicken number. The hot crinkle chips with preserved lemon and spiced butter add a little zing to the usual fries order. 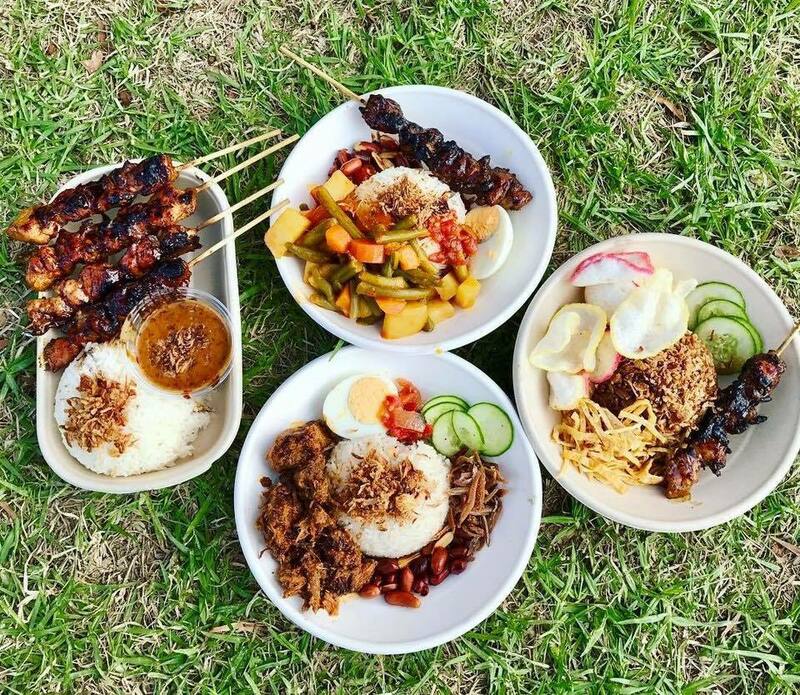 Indonesia has a long history of roving street food, so it was only a matter of time before an Indonesian food truck hit the streets of Melbourne. Satay Truck's main offering is charcoal grilled satays, which are as close as you're going to get to the smoky stuff in Jakarta. 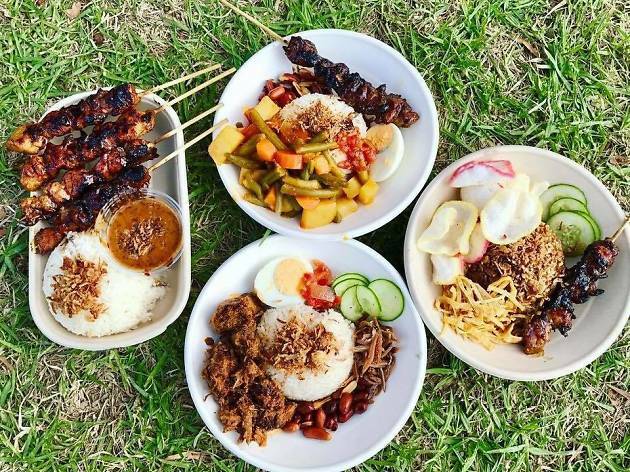 They also make popular takeaway meals like nasi uduk (coconut rice with beef rendang and other condiments), a classic nasi goreng, and gado gado – a salad of tempeh, blanched vegetables and peanut sauce. Now for something sweet, and this one's a real torcher. 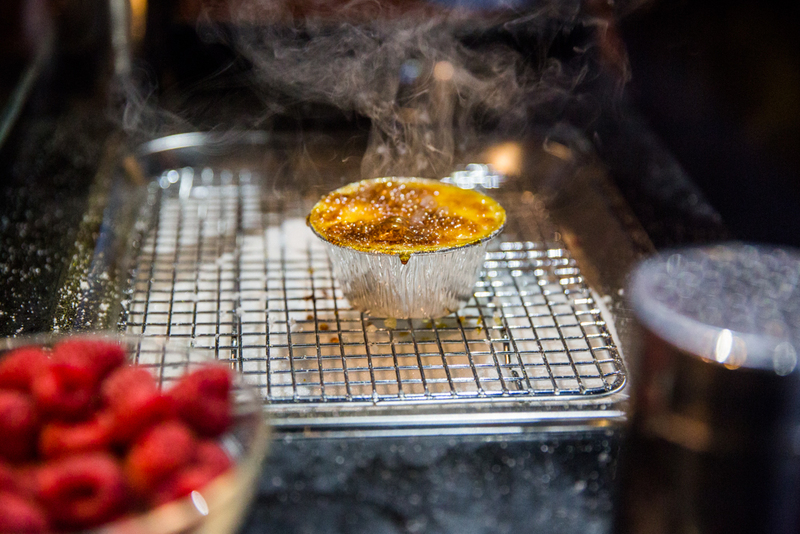 The Brûlée Cart is bringing toffee-crusted, raspberry-topped creamy custard to the people of Melbourne, and the best part is, the crème brûlées are torched on demand so you know you're always going to get a fresh caramel lid you can crack into. 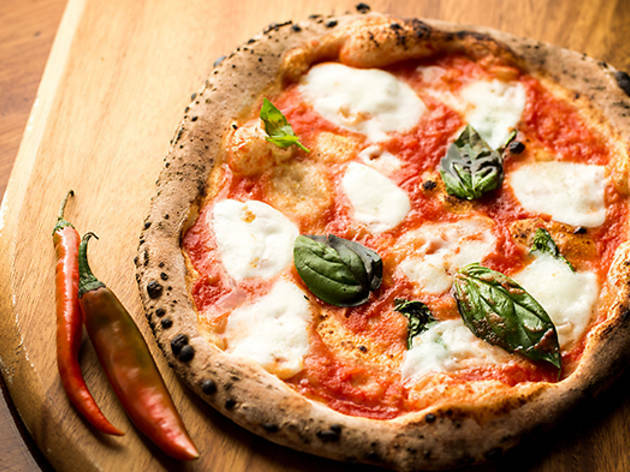 Soul Kitchen Pizza Truck serves city slickers with wood-fired pizzas out of their impressive mobile oven. 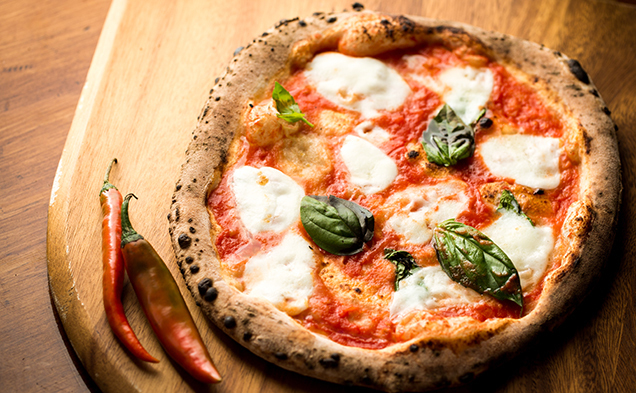 House favourites are the classic Margherita and the Italian Job with pork and fennel sausage and fior di latte. Polish it off with some sweet Nutella pizza topped with strawberries. Coffee by St Ali is no afterthought, and will keep you buzzing long after you've demolished your slice. Jamaican cuisine isn't something you come across too often in Melbourne, but the Real Jerk is definitely filling that gap. The spicy jerk chicken or pork is grilled and served traditionally with rice and salad. If you see them slinging cassava chips, order some. The root vegetable makes an amazing alternative to potatoes and goes really well with the smoky jerk dishes. The only thing better than a burger is more than one burger. 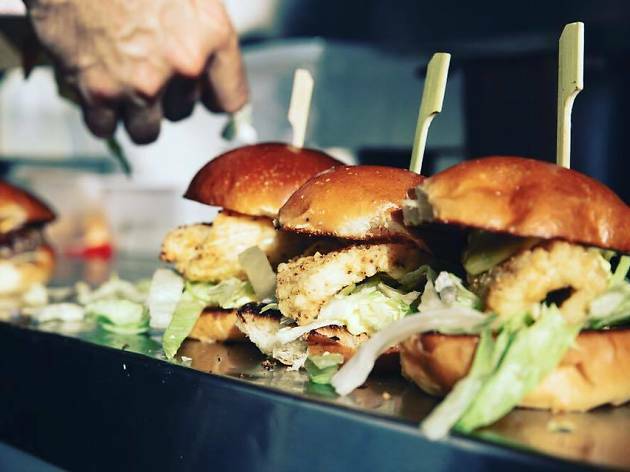 This is where sliders come in (because smaller burgers means you can eat more than one). Sliders on Tyres know what’s what. 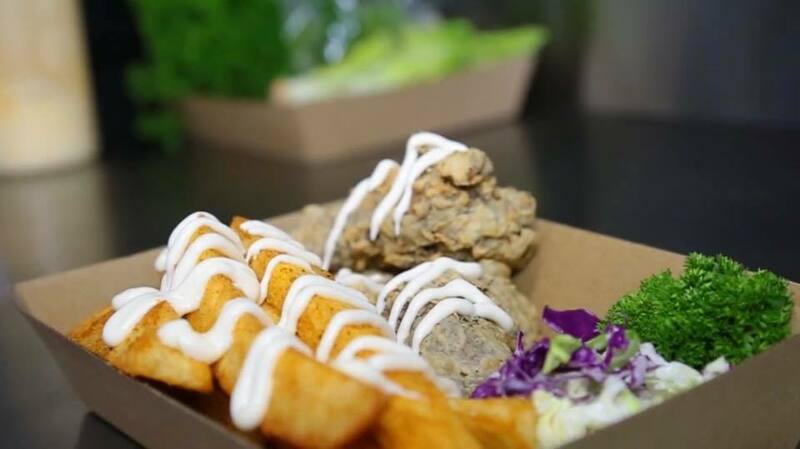 They’ve got the mini burgers packed with fried chicken, beef brisket, calamari, or roasted veggies. You can also get a classic mini cheeseburger to capitalise on that stomach space. Jim White is pushin' all-American deliciousness in the form of his barbecue meats. Think smoky, sauce coated ribs, pulled pork nachos and beef brisket rolls. If you are vegetarian, vegan or simply don't have an appreciation for meat, then Smokin' Barry's may not be your cup of tea. A crisp house-made apple 'slaw is the only concession to those who don't like food with faces here. 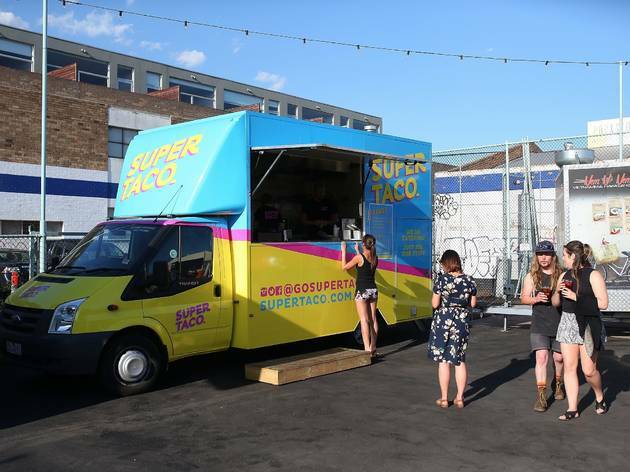 You'll find the van doing the rounds at festivals in summer as well as trawling food truck musters. 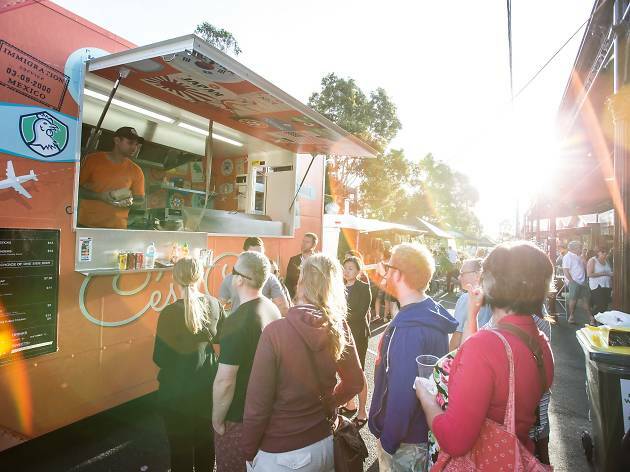 Welcome to Thornbury led the way by setting up a food truck muster with a permanent bar and now parks, gardens and even side streets are opening up for food trucks to congregate. 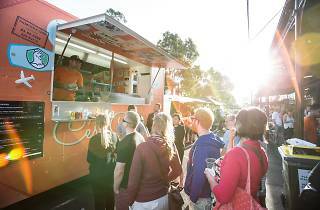 Here are some of the more popular spots to find Melbourne's best food trucks.